Mobile staff, delivery drivers, breakdown personnel, etc. Telefleet enables selection of the best resources in the field for each task. Decisions are taken based on priorities, skills, proximity, andavailability. 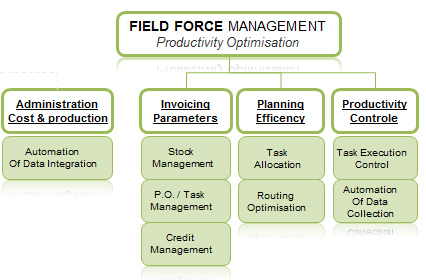 The working time management modules and reports allow analysis of and reduction in unproductive time. The working time reports eliminate paperwork and reduce the time taken to record services. 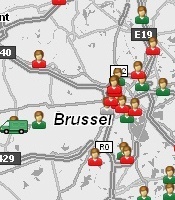 Telefleet enables the right information to be communicated tothe right people in real time. Task planning and direct communication with mobile personnel are crucial for many businesses. Tasks can be assigned and accepted via the GSM network using the integrated communications module. Telefleet helps field staff to be punctual, to be informed directly of tasks to be completed, and to focus on their objectives via its messaging, task description and on-board navigation functions. Telefleet keeps precise record of working times, time spent working on a customer’s premises, on the road, between two destinations, etc. For certain sectors, Telefleet automates the calculation of specific reports. In Belgium, for example, the building industry sector requires the calculation of mobility allowances to compensate workers for the time spent travelling (depot/home – construction sites). Different types of report give details of the distance covered and travelling time and allow identification of the driver and passengers. Each sector has its own requirements, Telefleet is modular and its functionalities can be adapted as required. Telefleet can be interfaced with your critical applications. Telefleet offers planning tools with real added value: field force management, two-way communication, management of different types of tasks in real time (intervention, repairs, delivery, loading, maintenance, etc). For more responsible drivers, Telefleet offers a module based on the analysis of driving behaviour: driver’s habits, speed, profile, fuel consumption, etc. Immediate monitoring of the state of completion of tasks.